Its more than just a train station! There are a number of fine shops, upscale restaurants and casual eating places where you can get anything from cup of soup and a sandwhich to a porthouse steak. You can also purchase fresh fruits and vegetables, the finest cuts of meat, cheeses, and a host of other specialty food items at the Grand Central Market. 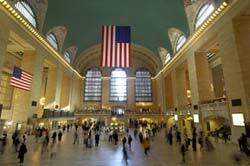 They also have many exhibits and events throughout the year at Grand Central Terminal. Take a look at the link to their website and see what's going on at the terminal when you're in town. Between 42nd and 46th Streets and between Lexington Avenue and Vanderbilt Avenues. Open to the Public from 5:30am until 1:30am, 7 Days a Week. FREE to visit the Terminal. 4, 5 or 6 train to 42 Street Grand Central Station. Shuttle from Times Square. Preferably M1 or M6 bus.